The role of multi-agency meetings? This section aims to support your understanding of multi-agency working and why it’s essential to meeting the individual needs of clients with advanced ill health. It also considers the qualities we bring to our interactions with them, and tools that may help you identify what supports are needed, and who can best support you. A shared, multi-agency, and co-ordinated way of working is vital in making sure clients can access the best possible care. Achieving this will require some creative thinking about how to provide a realistic and flexible approach that clients can relate to and access, as opposed to the one-size-fits-all approach found in many mainstream services. Currently, people experiencing homelessness rarely have access to palliative care, making it even more pressing. We know that homeless people face particular challenges in accessing health care support. Many people with advanced ill health who are homeless have ongoing complex needs, behaviours and substance use issues, as well as illnesses characterised by a high level of uncertainty, such as liver disease. Because of these complexities, multidisciplinary teams are needed to share ideas and make realistic plans that fit the needs of the individual within current services. If started early enough multi-agency working can help us to consider current and future care needs, and provide support to clients and staff throughout the client’s illness. We have developed some tools that you might find helpful when working with other services. Consider early on the need for multi-agency working. A client does not need to be identified as palliative before discussing your concerns with other professionals and services. You and your team’s concerns can be enough to call a meeting. You do not have to wait for others to request a meeting. The multi-agency working activity sheet might help your service or project think about what supports are needed, and the who can support you tool could help identify sources of support. Consider the value of your project facilitating multi-agency meetings. This may help to ensure meetings take place as and when needed. Facilitating meetings also enables you to have more contact and build relationships with everyone involved. If possible. holding multi-agency meetings at the project could be an opportunity for others to learn more about the client’s living environment. The multi-agency prompt tool could help in planning for and bringing structure to the meetings. Having a nominated coordinator to promote continuity and attendance can also be useful. This role can be rotated if needed. Staying true to who we are, and maintaining our intentions to do the best we can with clients and others is perhaps the most important quality we can bring to our interactions with them. The attitudes we bring are also very important. They are what enable us to focus on what the client wants at any moment in time, rather than what we may want for them, e.g. striving to ensure a client goes to detox when this may not be what they want or able to achieve at this time. Multi-agency working can be an efficient way of bringing everyone together to share ideas, skills and concerns about a client’s care, and develop care plans and actions. It can also be a forum in which to discuss more than one client you are concerned about, so everyone involved in their care is aware of the situation and can be involved in making plans. Bringing together a range of expertise, information and skills to meet clients’ holistic needs, a key factor of palliative and end of life care. Opportunities to meet regularly to share ideas, aspirations, plans and concerns about a client’s care, and help with assessments to ensure clients can access everything they are entitled to. Opportunities to provide support earlier for you, your team and clients. Supports conversations about future wishes and care for clients with advanced ill health (advance care planning). Promote a sense of shared responsibility around concerns and risk management. This could include the storage of medication at a project or managing complex symptoms and behaviours. A greater chance of providing person centred care that considers what really matters to clients at any stage in their illness trajectory. Poor communication across services – e.g. a lack of information sharing between hospitals and homeless services around discharge planning, or not knowing who has had what conversations with clients or others. Availability of services – limited availability of services to provide care in the project. Decision-making processes – e.g. different viewpoints, interpretations and attitudes among professionals as to what might be in the best interest of a client. Working within different models of care – there are particular challenges in providing palliative care in systems with a recovery focus. Working in different settings – the lack of opportunity or time for everyone to meet and share ideas, often due to people’s schedules, work places and limited time. Leadership – for example a lack of a coordinated response, or nominated person to coordinate meetings and share information. This short video aims to highlight some of these challenges, and of how it is to be homeless and unwell. The map below outlines the core aims and values of a multi-agency response to supporting people who are homeless, one that adopts an individualised person centred approach to care. This is particularly important for clients whose health you are concerned about. 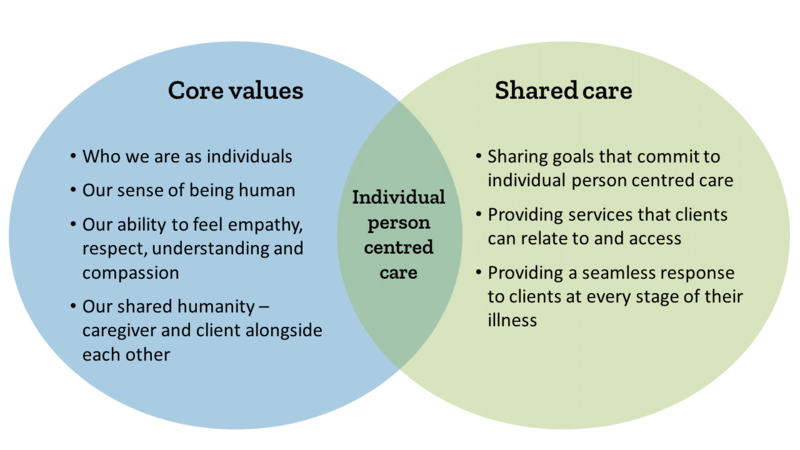 This approach to care means responsibility for care is shared between professionals with a range of skills and aims to ensure the client has the best support possible from all agencies involved. Consider early in a client’s illness the benefits of multi-agency working and who can support you and the client. This is particularly important where future planning may be needed for potential obstacles or challenges, such as place of care issues, or managing the uncertainty surrounding some illnesses. The who can support you tool could give you ideas about the types of professionals and services that could be included in your multi-agency team. Use the multi-agency working activity sheet to help you think about multi-agency working, and the level of support needed for clients whose health you are concerned about. Consider nominating a key person from within your project to provide a link between those providing care to clients. They could help to keep track of meetings concerning high-risk clients and monitor developments in their care. This role can be rotated. Multi-agency meetings are at the heart of effective multi-agency working. As project staff, taking an active role in facilitating such meetings brings many benefits, not least in supporting earlier responses to challenges or concerns you have about a client, particularly when notable changes in their health have occurred. Meetings can be regular, as required, or part of existing multi-client meetings. If a client’s health begins to deteriorate, meetings could become more regular and be attended by everybody involved, where possible. Case review – discussing one client’s current and future care needs with people from other professions. Multiple clients meeting – a meeting attended by professionals from a range of services in which you discuss multiple client’s about whose health you are concerned in order to plan for their current and future care and support needs. Client’s consent, participation or absence. For instance, respecting a client’s choice to attend or not, supporting them if anxious about attending, and carrying out appropriate follow-ups with clients unable to attend. Knowing who to invite and who can support you. This depends on the nature of the meeting, as there may be additional people or specialists you might like to invite. Circulate minutes and action points so that those within the multi-agency team who could not attend are kept up to date. Respecting the different viewpoints, interpretations, attitudes, roles, beliefs and values within the team. Exploring these differences is an integral part of any multi-agency meeting, and should be encouraged in a professional manner. Language- avoid using complicated medical terms – ask if you are unsure what something means. If clients are present ensure they are included in any discussions. Be particularly aware when English is not their first language. Consider setting up and facilitating meetings, particularly when notable changes in a clients health have occurred. You do not have to wait for other professionals to initiate them. The who can support you tool could give you some ideas as to who to invite. The multi-agency meeting prompt tool could help in planning for and bringing structure to the meetings. This tool can help you think about and document the concerns and wishes of both the client and the project, and also record actions arising. To be effective, multi-agency working must consider how to improve the quality of life of each client, and how working together could make this happen. It must take into account the individual needs of clients. what they can expect from those providing care and how they want to be treated. How the team responds to what really matters to clients as their health deteriorates is a key determinant of how well they are likely to engage with services, and how well they can measure the quality of care and support they receive. Being treated as an individual, with dignity and respect. Being in control of their journey. Being supported in a place of their choosing. Having the role and emotional needs of carers and family recognised and respected. Committing to a more person centred approach to care only really works if it forms part of a multi-agency approach. Quality of care is not only dependent on client’s being able to access services that offer choice, but also on the human qualities and attitudes we bring to our interactions with them (e.g. empathy, understanding, respect). The graph below depicts this. 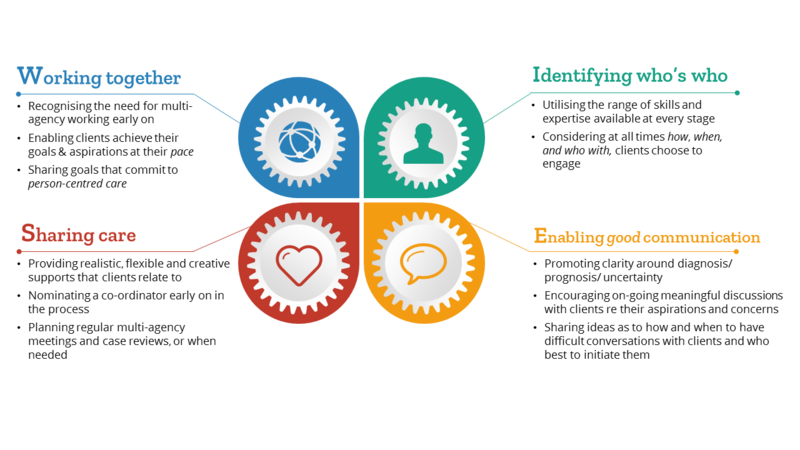 Enables clients to be centre of decision-making and their own care needs. Encourages clients to work towards their aspirations and goals at their own pace, while also planning for future eventualities including the possibility of change (see Parallel planning). Provides a bespoke multi-agency approach that’s realistic, flexible and creative which each client can relate to and access. Respects the choices clients make, even while trying to encourage new ones. Accept that clients may change their minds several times along the way, engage poorly with services, or continue using substances, despite best efforts to remain well. Never gives up on clients. This relates to who we are as individuals as much as the role we have in supporting clients. It can be seen in the way we bring qualities such as empathy, respect, kindness and understanding into our interactions with them. Similarly it can be found in our intentions to do the best we can for them. It also relates to another key quality we can bring with us, namely our ability to show compassion to one another. Compassion is by definition relational (i.e. it is about how we connect as human beings). It literally means ‘to suffer with’, so compassionate end of life care for clients not only considers their individual holistic needs, but also connects to our shared humanity – caregiver and client alongside each other on the journey. Empathy is a key skill in communication, allowing rapport to be created quickly and effectively. Empathy is different from sympathy and pity. Empathy is the ability to perceive the meanings and feelings of another person, and then to communicate that feeling to them, to show you are listening to them. This useful document outlines the differences between pity, sympathy and empathy and how it could be useful in your work. The personal qualities we bring will influence how clients engage with support.They also inform how the multi-agency team respond to what really matters to clients at different stages in their illness, rather than what we would choose for them. This can be challenging, particularly when we wish for clients to make different choices, such as when they make informed decisions to continue drinking, or not engage with services. For this reason, the attitudes we bring are also very important. Below are some key ones to consider, but there are others you can bring to mind. Allowing things to be just as they are with clients, rather than wanting things to be different. Often we will struggle to accept things the way they are in our own lives and when supporting clients. We may sometimes want different outcomes from our interactions with them. An example of this is when clients make choices that we feel are not in their best interest. The more accepting we can be of the way things are, the more able we are to focus on what really matters to clients, and what really matter to us as well. This allows us to consider alternative responses if needed, and it allows clients to feel listened to and respected. For instance, how might being more accepting of a client who chooses not to engage with services (such as detox) influence the interactions you have with them? The opportunity to explore other options with them can always occur another time. Allowing things to emerge for clients in their own time. Our minds have a natural tendency to expect instant results and particular outcomes. When not achieved this can lead to disappointment, frustration, worry, or all three. The more patient we can be with clients, the more at ease we are likely to be in our interactions with them. This can also help clients to feel more in control. Being patient also encourages clients to work towards their aspirations and concerns at a pace that is comfortable for them. For instance, struggling to get clients to engage with their GP about their poor health. Regardless of how and when a client may decide to engage with the GP, how might being more patient with the situation influence the ease at which you interact with them in that moment? How might it make them feel? Not always needing to strive for particular outcomes, or to make things right. Striving for outcomes can be a positive thing, but often can be based on what we think we want, rather than what we may actually need. Bringing an attitude of non-striving to our interactions with clients may allow us to see more of what is important to them, and how we could respond. While we can always continue to encourage clients to make positive choices, there will be times, (with good intention) where striving for particular outcomes will cause clients to disengage with us. If we continue to push an outcome without listening to what a client really wants, they may feel judged or that they have let us down. How might they engage differently with us if we let go of wanting things to be different? How might this influence the way clients listen to the ideas we have about what might help? Reflect on the attitudes and qualities you bring to your interactions with clients. How do they influence your interactions with clients and colleagues?